Doors are supplied in sets that are either printed with a connecting loop printed through openings in the door, or where there is no opening, they are printed as a flat sheet with connecting tabs. The tabs are easily cut through and the door can be filed or sanded smooth prior to installation. This allows the set to be kept together during the printing process and significantly reduces the printing cost. Doors are available in a number of types. Each type is available in multiple scales. Some types are also available in different door widths. To get detailed information on the range of doors. their sizes and the size of the opening required, click here or on the datasheet image to the right. If there is a particular door that is not currently available in a size or scale that you would like, send a message or leave a comment and I will see if it can be added to the range. 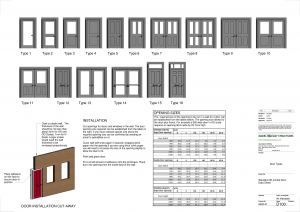 Scroll down to view the current range of door types. Clicking on a "buy now" will take you to Shapeways website, where you can select your scale then add the items to your basket and go through their checkout process. All prices shown below are for HO scale. Price changes occur according to scale and the material being printed. An external glazed door. Place a small amount of adhesive on the architrave to hold the door in place.. Available in a range of scales. Illustrated is the price and image for HO Scale. Clicking on the buy now takes you to the Shapeways website where you can select your preferred scale. The price for that scale will then be displayed. There are 5 left handed and 5 right handed doors in the set. Insert into wall opening from the interior side, using a small amount of adhesive on the door architrave to hold in place. Cut a piece of clear plastic or acetate to glaze the door. Fix with clear adhesive such as canopy cement. There are 5 left handed and 5 right handed doors in the set. Insert into wall opening from the interior side, using a small amount of adhesive on the door architrave to hold in place. Cut pieces of clear plastic or acetate to glaze the door. Fix with clear adhesive such as canopy cement. A set of six panel doors. The size of door leaf is 760mm x 2000mm. Door opening sizes include doors plus frame. The actual opening size is shown at Shapeways, or click here for a data sheet. A door of this size would be typically used as an internal door. Also suitable for back doors, exterior cupboard or store room doors. The door is also available slightly wider as an 810mm wide door. A set of six panel doors. The size of door leaf is 810mm x 2000mm. Door opening sizes include doors plus frame. The actual opening size is shown at Shapeways, or click here for a data sheet. A door of this size would be typically used as an internal door. Also suitable for back doors, exterior cupboard or store room doors. The door is also available slightly narrower as a 760mm wide door. A four panel door of this type could be used in a variety of situations. Wider doors would be used as entrance doors or doors in public buildings. Narrower doors would be used as internal room doors and cupboards. The size of door leaf is 660mm x 2000mm. Door opening sizes include doors plus frame. The actual opening size is shown at Shapeways, or click here for a data sheet. The size of door leaf is 760mm x 2000mm. Door opening sizes include doors plus frame. The actual opening size is shown at Shapeways, or click here for a data sheet. The size of door leaf is 810mm x 2000mm. Door opening sizes include doors plus frame. The actual opening size is shown at Shapeways, or click here for a data sheet. The size of door leaf is 900mm x 2000mm. Door opening sizes include doors plus frame. The actual opening size is shown at Shapeways, or click here for a data sheet. A glazed door.available in a range of scales. Illustrated is the price and image for HO Scale. Clicking on the buy now takes you to the Shapeways website where you can select your preferred scale. The price for that scale will then be displayed. An external glazed door.available in a range of scales. Illustrated is the price and image for HO Scale. Clicking on the buy now takes you to the Shapeways website where you can select your preferred scale. The price for that scale will then be displayed. A partially glazed double door.available in a range of scales. Illustrated is the price and image for HO Scale. Clicking on the buy now takes you to the Shapeways website where you can select your preferred scale. The price for that scale will then be displayed. The size of each door leaf is 760mm x 2000mm. Door opening sizes include doors plus frame. The actual opening size is shown at Shapeways, or click here for a data sheet. Insert into wall opening from the interior side, using a small amount of adhesive on the door architrave to hold in place. Cut pieces of clear plastic or acetate to glaze the door. Fix with clear adhesive such as canopy cement. The size of each door leaf is 810mm x 2000mm. Door opening sizes include doors plus frame. The actual opening size is shown at Shapeways, or click here for a data sheet. Insert into wall opening from the interior side, using a small amount of adhesive on the door architrave to hold in place. Cut pieces of clear plastic or acetate to glaze the door. Fix with clear adhesive such as canopy cement. Double doors of this type could be used in a variety of situations. Typically would be used as entrance doors or doors in public buildings. Glaze panels with clear plastic or acetate. A set of three double four panel doors. The size of each door leaf is 660mm x 2000mm. Door opening sizes include doors plus frame. The actual opening size is shown at Shapeways, or download a door data sheet by clicking here Double doors of this type could be used in a variety of situations. Typically would be used as entrance doors or doors in public buildings. A set of three double four panel doors. The size of each door leaf is 810mm x 2000mm. Door opening sizes include doors plus frame. The actual opening size is shown at Shapeways, or download a door data sheet by clicking here. Double doors of this type could be used in a variety of situations. Typically would be used as entrance doors or doors in public buildings. A set of five double two panel doors. The top panel of each door is left open for glazing. The size of each door leaf is 810mm x 2000mm. Door opening sizes include doors plus frame. The actual opening size is shown at Shapeways, or download a door data sheet by clicking here. Double doors of this type could be used in a variety of situations. Typically would be used as entrance doors or doors in public buildings. A set of five double panel doors. The top panel of each door is left open for glazing. The size of each door leaf is 810mm x 2000mm. Door opening sizes include doors plus frame. The actual opening size is shown at Shapeways, or download a door data sheet by clicking here. Double doors of this type could be used in a variety of situations. Typically would be used as entrance doors or doors in public buildings. A set of five double panel doors. The panels of each door is left open for glazing. The size of each door leaf is 760mm x 2000mm. Door opening sizes include doors plus frame. The actual opening size is shown at Shapeways, or download a door data sheet by clicking here. Double doors of this type could be used in a variety of situations. Typically would be used as entrance doors or doors in public buildings. A set of five double glazed doors. The panels of each door are left open for glazing. The size of each door leaf is 810mm x 2000mm. Door opening sizes include doors plus frame. The actual opening size is shown at Shapeways, or download a door data sheet by clicking here. Double doors of this type could be used in a variety of situations. Typically would be used as entrance doors or doors in public buildings. Door Type 15 is a front entrance door with fanlight over. The doors are available as a set of 10, 5 right handed and 5 left handed. This set is sized to suit a cut-out of 13mm wide by 31.5mm high. The internal architrave forms a flange for gluing into the opening. The fanlight can be glazed by gluing a cut piece of acetate pr similar clear plastic to the inside. Door Type 16 is a front entrance door with fanlight over. Specifically designed to suit the Kingsway Georgian Terraced Houses card kit. Door Type 16 is a front entrance door with fanlight over. Specifically designed to suit the Kingsway Georgian Terraced Houses card kit.The doors are quite narrow by comparison with the normal dimension of entrance doors. The doors are intended for a cut-out dimension of 12mm x 36mm. The internal architrave forms a flange for gluing the door into the opening.